Values in ( min. - max. ) format. The pear is a fruit that has expanded all over the world; it is consumed both fresh as cooked, and that is available all throughout the year. There are multiple varieties cultivated, ranging in shape, size and colour. The pear has several medicinal properties thanks to its content in water and fiber; it is also rich in vitamins and minerals. It is suitable for purifying the organism and to clean the intestine. Moreover, it is a diuretic fruit and it supplies minerals to the organism. Along with the European type of pear there is a near species, the Asian pear or nashi, scarcely known in Europe but widely spread in the Asian continent. There are several foodstuffs processed from the pear, such as fruit salad, jam, liquor or juice. 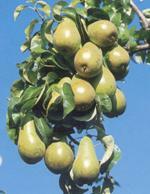 The pear is widely spread in the world, as much in the N hemisphere as in the south. It is mainly cultivated in Asia, whose production accounts for more than 60% of the world production. In Spain, the consumption per person and year in 1988 was 7.9kg. 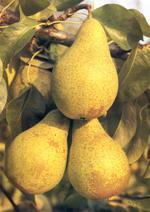 Until the XVIth century, pears were only used for cooking, stewed or roasted. The first pears for fresh consumption were obtained in France and Italy towards the end of this century. The fruit’s botanical name is pomo. It is formed by different parts of the flower, along with the ovary and the seeds, that are placed in the central part of the fruit. In some cases, there even grows a fruit from a flower that has not been fertilized. This phenomenon is of great importance for some varieties, like Conference, Doctor Jules Guyo, General Leclerc and Passacrassana. One of the characteristics of the pears is the typical gritty texture that some varieties show, caused by the presence of woody cells within the pear’s meat. These cells have been removed in the most modern varieties in order to improve their texture, although it has been kept in others. Within the different pear varieties in the world, there are soft and hard pears, suitable for fresh consumption or cooking, varying their shape from round to fine and elongate, in some cases curved shapes, and with great variety of sizes. It also ranges in colour, from a grayish green colour to a dark yellow. The meat of the mature pears for fresh consumption is soft, juicy and sweet, whereas the pears for cooking are usually hard and gritty. In some cases the skin is edible, whereas in others it is not. Along with the European type of pear there are other near species such as the nashi or Asian pear, cultivated mainly in China, Japan, South Korea, the United States, New Zealand and Australia. The nashi is a more or less globose fruit, sometimes slightly flattened. They can be quite large. The colour varies from a golden-brown for rough fruits, and yellow for smooth fruits. Fresh pears are widely consumed in Europe, some are tinned and others are used to make a type of cider. 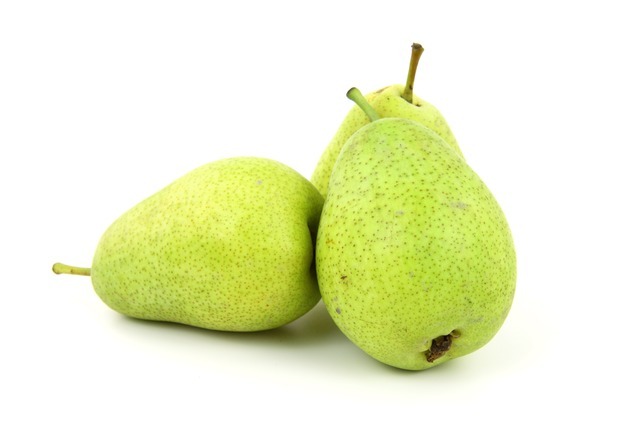 Pears are usually consumed as dessert, intact (peeled or not) or cut up for fruit salad. Moreover, they can be used in jam, syrup, juice and liquor, to make cakes, ice creams, etc. The pear is available all the year round, because it is produced in different regions of the world, both in the N hemisphere as in the south, and thanks also to the wide range of varieties, with different periods of maturation. It can also be kept in cold storage rooms, and the current means of transport allows their transport to any place of the world soon after their harvesting. The pear is low in calories and not very acid. It supplies vitamin C, fiber, potassium and vitamin E. Besides, it has small amounts of vitamin B1 and B2, thiamin, rivoflavine, niacin and ascorbic acid. The pear tree belongs to the family of the Rosaceae; its scientific name is Pyrus communis. It is a piramidal tree, round during its youth, that can reach up to 20 meters of height, although the modern varieties are trees of small size, in order to facilitate the tasks of culture and harvesting. It lives an average period of 65 years. The trunk is high, thick and of grayish colouring, with a cracked bark and deep roots. The pear tree sprouts before the apple tree, and the flowering begins in the middle of March. It is very sensitive to spring frosts, although it bears temperatures of -20ºC during the winter. It prefers silty, healthy, aerated and deep soils. The leaves are oval, whole or in some cases finely indented. The flowers are white and sometimes pink, and they are grouped forming corymbs of 9 to 11 flowers. They are hermaphrodite, that is to say, each flower has both sexes. The fruit is called pomo, of variable shape and colour, although it is usually elongate and of green or yellowish skin, with few black and small seeds.